White Plains Church St elementary school was chosen this year as the proud recipient of the coveted Nina Chin Green Writing Grant. Students of grade 3 through grade 5 were invited to voluntarily write an essay on how they personally can make a difference in this world. Nina Chin was a lifelong educator and she believed that writing is the key to being a better reader and a better person. Every year she sponsored from her own money a writing contest among her students. Upon her passing, her children decided to carry on this lovely tradition and have sponsored one school in Westchester every year. Over 50 students rose to the challenge and Myra Castillo, Principal, is holding proudly the stacks of essays from her students. These essays are right now on the desk of two retired teachers that are “judging” them. Ten students will be proud winners of a nice envelope for their work. We cannot wait until the celebration, that is soon to come. Watch this space! Implementing a Recycling Program in a building with 3500 students is a daunting experience. It is a mini city. How does one get these many people to change their wicked ways? 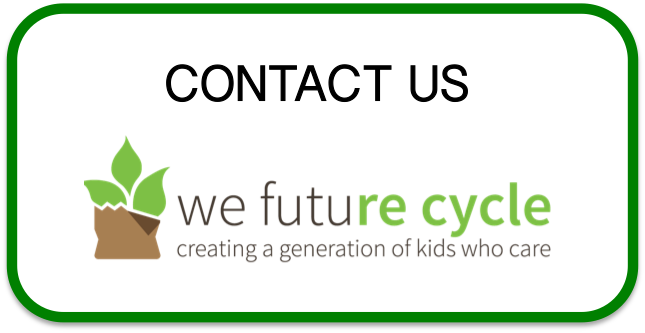 We Future Cycle has done just that this school year and now 3500 students and hundreds of teachers and other adult staff are fully trained to separate their packaging from food waste so each can go into recycling or composting. Garbage was reduced from 100 bags every day, to about 2. All the rest of the material is sorted into recyclable packaging and compostable organics. All 4 lunchrooms are successfully participating and all classrooms are sporting paper, commingled and trash receptacles, reducing garbage even further. The last frontier were the outside areas and We Future Cycle and the high school grounds staff are tackling this problem now. Green recycling bins displaying colorful informational stickers as well as an educational board explaining the stunning economics of recycling are popping up next to the outdoor garbage cans. And today, we took a peek to get the answer to the question. Do high school students transfer learned behavior to other life situations when offered the easy logistics. And the answer was a very satisfying. YES! Check out this wonderfully sorted content of recycling bin. I promise, I did not mitigate before taking the picture!